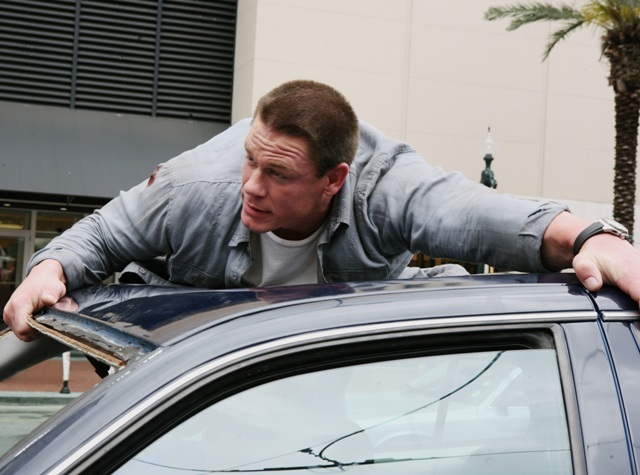 The reasonably effective Cena (although he had more to do in “The Marine”) plays a New Orleans police officer named Danny Fisher, an average cop who happens to stop a brilliant thief whose girlfriend is accidentally killed in the process. A year later, the thief has escaped from prison with only one apparent goal - enacting his revenge on Danny. 12 Rounds was released on Blu-Ray on June 30th, 2009. The criminal mastermind unleashes a ridiculously plot-hole-filled series of challenges for our muscled hero, including stopping a moving cable car and escaping an about-to-drop elevator. Each round supposedly gets Danny closer to rescuing his kidnapped wife from the grip of his enemy. As with all films like this one, the local cops and FBI are typically incompetent and only our “Die Hard”-esque hero can save the day. Action director Renny Harlin was once at the top of his game, producing action hits like “Die Hard 2,” “Cliffhanger,” and the underrated “The Long Kiss Goodnight”. He has some definite missteps in the ’90s (like “Cutthroat Island”), but his recent work has almost seemed like a competition to sink lower than the film before. The sad thing about “12 Rounds” is that even though “Driven,” “Mindhunters,” “The Exorcist: The Beginning,” and “The Covenant” are undeniably bad, they all have a personality, an element missing from this by-the-numbers affair. “12 Rounds” simply throws one stunt sequence after another without concern for character, suspense, or remotely believable dialogue. I’m actually stunned that the script by Daniel Kunka ever got the green light. This is such generic, two-dimensional material that it never should have made it past pre-production. It’s the kind of dialogue that would exist in a movie-within-a-movie, perhaps a preview in a film like “The Player,” mocking the worst trends of the action genre. Twentieth Century Fox’s Blu-Ray presentation of “12 Rounds” helps the boom-boom-pow effect of the film with a Dolby 5.1 DTS-HD Master Audio track that almost disguises the pic’s many flaws with its explosive mix. The video in 1080P is better-than-average for Fox. The special features are also better-than-average for the studio, including an unrated cut of the film that includes a commentary by Harlin and a separate commentary by Kunka and Cena. I’ve only seen the unrated cut but it seems like it would have gotten a PG-13 as well and is yet another case of a deleted scene or few alternate takes being advertised as “Extreme Cut”. The bonuses also include two alternate endings for the film with optional commentaries, “Streetcar Crossing: Film With Caution,” “A Crash Course: John Cena Stunts,” 12 “Bonus Round” Featurettes, “Never-Before-Cena Gag Reel,” “Keeping Score: The Music of 12 Rounds,” “Round and Round With Renny and John,” Two Viral Videos, and a Digital Copy. Although most of the featurettes are short, it’s an impressive collection of special features for a truly unimpressive film. 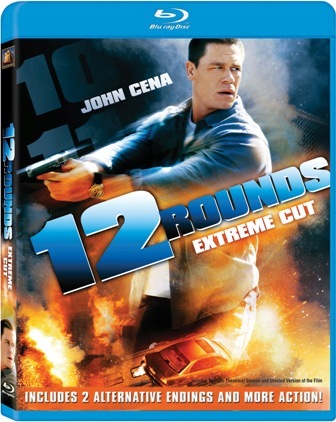 ‘12 Rounds’ is released by Fox Home Video and stars John Cena, Ashley Scott, Aidan Gillen, and Steve Harris. It was written by Daniel Kunka and directed by Renny Harlin. The Blu-Ray and DVD were released on June 30th, 2009. It is rated PG-13 or unrated. Submitted by Anonymous (not verified) on July 11, 2009 - 4:22am. Bahahah I laughed at how you review a movie without even watching it. He doesn’t shoot his girlfriend, she gets hit by a car. Before you try to be “critics”, watch the movie. Submitted by BrianTT on July 12, 2009 - 2:44pm. Honestly, I couldn’t care less if she was shot, hit by a car, or run over by a train. Is it the fault of the completely forgettable film that I missed the detail of how a character with only a few lines died or my own? Either way, I’ve corrected the error and, trust me, as much as I’ve tried to forget the experience, this “critic” watched the movie. Thanks for writing. Good luck with your future comments. Submitted by Anonymous (not verified) on July 28, 2009 - 11:20pm. Wow! To be so bitter must be absolutely exhausting.